Tuesday mornings at LYA are filled with music and movement for our youngest stars. Children aged toddlers through kindergarten look forward to Hebrew rhythmical movement with Early Childhood Director, Lilia Luzhanskiy. For half an hour the children dance, jump and move with the beat. A rhythmic session includes using hoops, bright colored scarves and streamers and the beloved parachute. Rhythmics is more than just movement and exercise. Lilia carefully designs the program to focus on hand-eye coordination, sensory skills, fine motor skills and language development. Each week children are exposed to new movements, skills and are building up their Hebrew language. Word of LYA's rhythmic program is spreading around town. In late October Lilia was invited by Sandra Garvey, an early childhood professor at STCC to lead a session of rhythmics for her adult students attending Creativity and Arts in the Early Childhood Class. 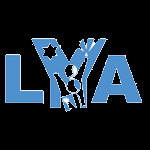 They had such a good time, that the class asked to come and observe rhythmics in action at LYA. We know that our students will love having guests and we bet that our guests will not sit idly by the sides observing. We are sure that they will join in the rhythmic movement fun that our children love so much.